When we did our basement re-org back in March, it came to light that we had quite a few old white wines hanging around. I have no idea how I forgot about them, or why they weren’t in CellarTracker, but there you have it. We’ve been trying to drink through them before they get too old. With that in mind, the wine for the evening was a 2004 Fritz Chardonnay. It hails from the Russian River Valley, clocked in at 14.2% alcohol by volume, had a real cork closure, and since it wasn’t recorded, I have no idea what it cost, though I’d venture a guess in the mid $20s. I believe it probably came in a club shipment back when we were members. I first noticed the strong aroma and dark yellow color of the wine. It was easy to tell this was an older white. The nose smelled of citrus, lemon, apple, pineapple, oak, caramel, and spice. In the mouth I found pineapple, green apple, oak, and citrus. 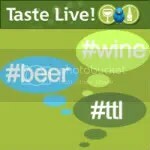 The wine was heavy in the mouth, and it was well structured. Overall, I’d say if you managed to hang onto this one all these years, drink it up. It was starting to lose the flavors in the mouth. 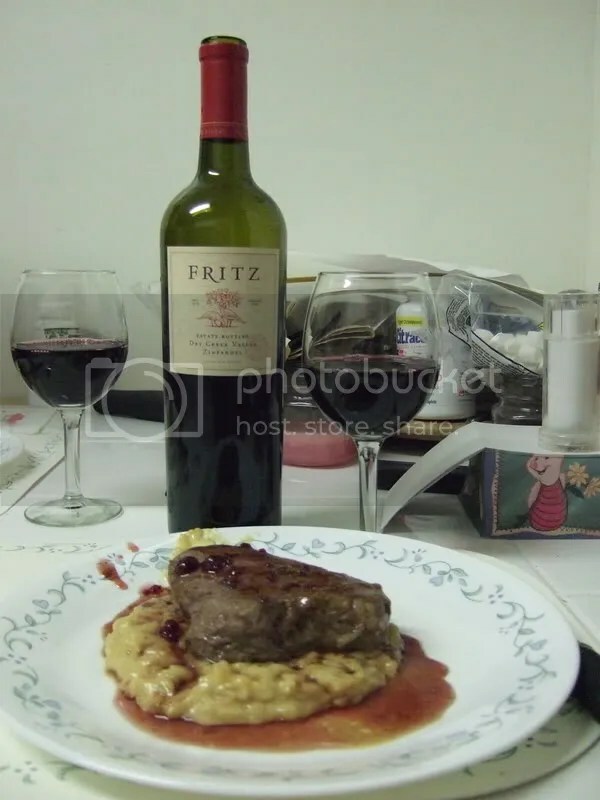 The wine was a 2004 Fritz Cabernet Sauvignon. The wine came in a club shipment, cost us $28 minus a club discount, clocked in at 14.2%, and had a real cork closure. On the nose I found raisins, cherry, spices, and oak. I also noted some earthy undertones. In the mouth I found berries and a bit of cherry. The wine was tannic and didn’t seem ready to drink. I’d hold onto this one if you have any. I served this with BBQ spare ribs, corn, and rice pilaf when my folks were here visiting. I think the wine would have been a really good match with the dinner had I let it decant for a few hours or saved the bottle for a couple more years. I found this bottle of 2005 Fritz Chardonnay hiding in our basement when Matt and I were reorganizing the wine last weekend. A surprise to me, as I thought I had written up all the white wines in my collection. The wine had a real cork closure, clocked in at 14.2% alcohol by volume, and cost us $20 in a club shipment. On the nose I found lemon, oak, butter, vanilla cream, and apple. In the mouth I found the wine to be buttery and oaky. Additionally, I got lemons, peach and more oak in the mouth. Overall, this was an oaky, buttery Chardonnay. It wasn’t flabby or anything, but I was overwhelmed by the butter and oak. It’s just NMS. We drank our very last bottle of 2005 Fritz Dry Creek Valley Zinfandel. I’m quite sad. This was a great bottle of wine that cost us $25, rang in at 14.2% alcohol by volume, and had a real cork closure. We last drank this bottle about 6 months ago in early February. You can read that review here. I’m currently dipping into wines we drank over 6 months ago to see if they’ve changed in that time. This time, I served the wine with pepperoni pizza (from Pizza Hut, I was not in a cooking mood for once!). A good match to the pizza sauce and spicy pepperoni. On the nose of the wine I found, currants, spice, sweet red licorice, and raspberries. In the mouth I found red raspberries, blackberries, and smoky vanilla. The fruit tastes really fresh. The heat I found last time seems to be gone. Drank my 2005 Fritz Pinot Noir the other night with Roz’s Zuppa Toscano. We had tried Pinot Noir with the soup before the match was a good one, so I didn’t want to mess with success. And it was a good match, but I found this Pinot Noir to be a bit heavier in the mouth than I am used to for Pinot Noir. The Fritz was 13.9% alcohol by volume, had a real cork closure and came in a club shipment so I have no idea how much it cost. We also have a bottle with “Clonal Select” written on it and I am not sure if they are the same thing…they have the same alcohol levels and since the actual science of winemaking escapes me, I have no idea if you could do bottlings with two different sets of grapes and come out with the exact same alcohol content. On the nose of the wine were black cherries, raspberries and spice, and then strawberries a little later. In the mouth it was smooth, though as I mentioned it was heavier than I am used to for a Pinot Noir. Flavors in the mouth were mostly strawberries and I would describe this wine as a fruity red. I would also suggest letting it air a bit before drinking as it seemed to develop nicely in the glass. I picked this bottle of 2003 Fritz Cabernet Sauvignon from our collection to pair with a dinner of homemade tomato sauce and ravioli. It cost us $30, is 13.9% alcohol by volume and is sealed with a real cork. We picked this one up from Fritz this summer and I have one more bottle still in the racks. Now I’ve recently been worried that perhaps our wine has been cooked over this winter by the heat in our apartment. As hard as I try, it’s very difficult to regulate the temperature in an apartment building that insists on keeping the heat on even when it’s 70 out. I try my best and have been freezing my tush off sleeping with out window in the bedroom open even when it’s 20 or below out. However, my fears have been put to rest over the past few days as we have had bottle after bottle that has been perfect. I’m now more inclined to believe that it may have simply been a case that got cooked in shipping, which actually makes sense to me now that I have pulled UPS records. One of our cases arrived suspiciously late compared to the others, despite the fact that all 14 were shipped on the same day. I can’t say for sure that all the wines I’ve been “eh” about lately came from that box, but if I were a betting woman…. In the mouth I found black currants. After a while some oak and spices showed through. Overall, this wine was incredibly smooth in the mouth, I would even call it silky after airing for a while. The wine is drinking very well right now, though I will be curious to see how the next bottle drinks. This time I will be more careful about actually saving the second bottle, though really, I could drink it now and be perfectly happy with it. Really, I do. I think I would have been in paradise if I could have attended the ZAP event that was held recently. I love the big fruit, the subdued fruit, the juicy, the jammy, the spices, basically everything about it. I even love the way it stains my lips. Well, I could go on and on and on about how much I love the wine made from this grape, but I think we’ve just about covered enough of it for the moment. We are also apparently on a Fritz kick this week, what with the Syrah for WBW and this bottle of 2005 Fritz Dry Creek Valley Zinfandel last night. Now, I know you are possibly (if you read my blog frequently) thinking, hey didn’t she review this just the other day? Well, I did, but I promise this bottle is actually different. It doesn’t have a little red banner in the corner indicating that it is a reserve or estate bottle or whatever it says, I can’t remember. 14.2% alcohol by volume, real cork closure and cost us $20ish in a club shipment. On the nose were blackberries, raspberries and pepper. In the mouth, there were crisp raspberries. I wouldn’t describe this as either juicy or jammy, but more on the tart side, like a raspberry that makes you pucker a little, but not in a bad way at all. The taste of this one lingered for a long while after swallowing. I think it could age just a little bit more, but I would say only up to a year. It’s almost perfect to drink now, just a little heat from alcohol that showed on the end in the first hour. This could easily be solved by decanting or just letting the bottle sit open for an hour or so before serving. After an hour in my glass, this was smooth, easy to drink, with no heat from the alcohol. I served this with grilled filet mignon with a currant and (this Zin) wine sauce over a bed of cheese risotto. Though this time I just threw in whatever cheese I had hanging around which happened to be extra sharp cheddar and fresh parmesean. Matt proclaimed it the best risotto yet. I give all the credit to the Cabot Seriously Sharp Cheddar. If you have never had Cabot cheese you are missing out, big time. Best. Stuff. Ever. I was so excited a few weeks ago when the Cabot people were in my grocery store to celebrate the store starting to carry their cheese. I talked with the rep for a while and got a cow magnet and a Cabot t-shirt. I lived on Cabot cheese in college. I guess it’s a Northern East Coast thing. Clearly we’ve hit on two of my favorite topics tonight: Zinfandel and Cabot Cheese. Make macaroni and cheese with a block of the Seriously Sharp. It will be the best tasting mac and cheese you’ve ever had. Okay, I’ll shut up about the cheese now, this is a wine blog after all.